The specter that is America’s opioid crisis claimed a record high number of lives—more than 40,000—this past year, a new report from the Centers for Disease Control and Prevention has found. And the collective destruction of the epidemic has helped lower the nation’s life expectancy for the second time in two years. The CDC’s National Center for Health Statistics released its annual morality report Thursday, which counts up how many people died last year and why, and estimates how these deaths and other factors affect the projected life expectancy of someone born that year. The overall death rate, which is calculated by standardizing the population across age groups, slightly fell, which is a long-standing trend. But compared to 2015, the true number of deaths rose by over 30,000, with around 2.7 million total deaths in 2016. 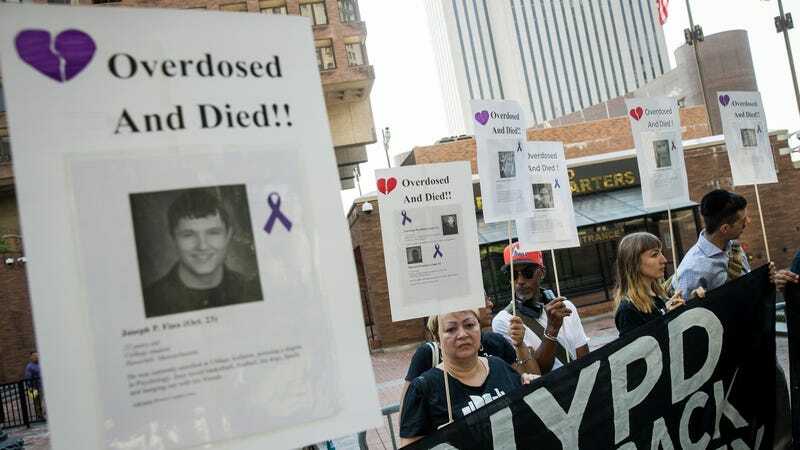 In particular, an accompanying report found there were more than 63,600 deaths caused by drug overdoses, the highest tally yet and a 21 percent increase from 2015—with more than 40,000 alone caused by opioids. Because of this, for the second year in a row, life expectancy took a stumble, from 78.7 years in 2015 to 78.6 in 2016. That specific feat is so rare in the modern era that it last happened in the early 1960s. And the last time life expectancy dropped for any single year prior to 2015 was 1993, during the height of the HIV crisis. Much of the decline can be traced to a rise of deaths from unintentional injuries (which includes overdose), but it’s also due to increased suicides and deaths from Alzheimer’s disease. Because of how life expectancy is calculated, young deaths have more of an impact on it than older ones. “I’m not prone to dramatic statements. But I think we should be really alarmed. The drug overdose problem is a public health problem and it needs to be addressed. We need to get a handle on it,” Robert Anderson, chief of the Mortality Statistics Branch at the National Center for Health Statistics, told NPR. Digging deeper, there are a few important distinctions to be made. For one, the life expectancy decline applies only to men. The average life expectancy of women, 81.1 years, remained unchanged from 2015. And though white men have gotten much of the attention lately as the group most affected by the opioid crisis, it’s black men who still have the highest death rate of any demographic group. Both black men and women, as well as Hispanic men, had an higher death rate in 2016, while white people in general saw a lower rate from 2015. The stats also reaffirm a disturbing trend addiction experts have noticed: The shape of the opioid crisis is changing. Synthetic opioids like fentanyl and its analogs have now become responsible for the lion’s share of overdose deaths. The age-adjusted death rate from these drugs, which are many times more potent than heroin and morphine, has more than doubled since 2015. The rise of these drugs has been linked to an influx of imports from countries such as China. In addition to being more potent, fentanyl and its analogs are often cheaper than heroin, making them a popular choice to cut or replace other drugs with. Because of this, though, users may take fentanyl wrongly marketed as heroin and end up overdosing. The depressing cherry on top is that there might be nothing in the immediate future that can stem the crisis. Any innovative technologies that could help—like vaccines or less-addictive prescription painkillers—are still years away from being widely available, if the research into them even pays off. And while local governments and advocacy groups have begun to take practical steps to help prevent addiction, save people from overdoses, and encourage people with addiction to seek help, the Trump administration has seemingly regressed to the failed model of past eras, which treats drug addiction as a moral failure rather than the highly inheritable disease that it is. This October, President Trump declared a public health emergency over opioids, a move that came with the lifting of some funding restrictions but no actual guarantee of additional funding or where it would go. One of the few ideas expressed in Trump’s speech announcing the decision was a desire to create public service announcements that would just tell people to avoid drugs altogether, a idea that sounds blatantly misguided to anyone who had to sit through DARE lectures in middle school (the pilot program since created to test out potential ads has been more encouraging in its variety of messages, but the very idea that ads will do much to prevent addiction is suspect). Kellyanne Conway, purveyor of “alternative facts,” has recently been appointed to head the administration’s opioid crisis response. As unbearable a hellscape this year has been, especially those for struggling with addiction, it’s tough to imagine things will be any better this time next December.